Walking down the back of The Acropolis, we ran into a homeless man playing a wooden flute, seemingly holding court with an audience of music-loving stray cats. Such a beautiful sight and one I’ll always remember, but I felt my camera would’ve been an intrusion, so I kept walking. 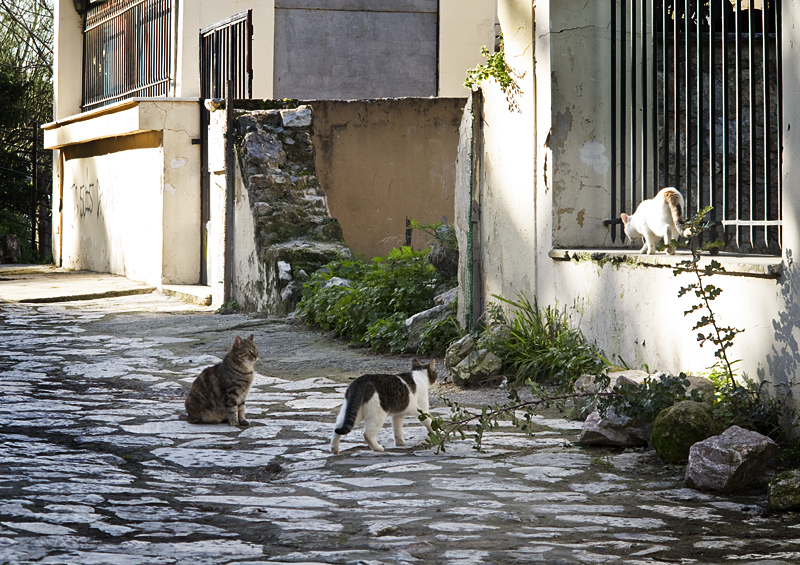 Stray cats are part of the Athenian landscape, and people seem to kindly accept them. I wrote in an earlier post about the cat that wandered into the wine bar without anyone batting an eye. 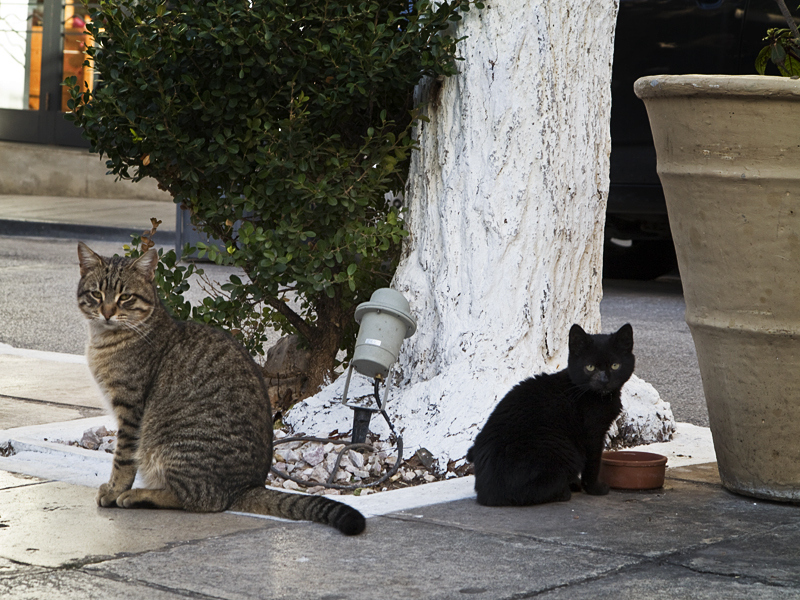 The black kitten and the tabby pictured above make their home base at a café whose owner feeds and waters them, and I even saw a security guard at the Parliament building petting a stray. It makes me happy to see people treating animals kindly, and this left me with a very positive impression of Greeks. 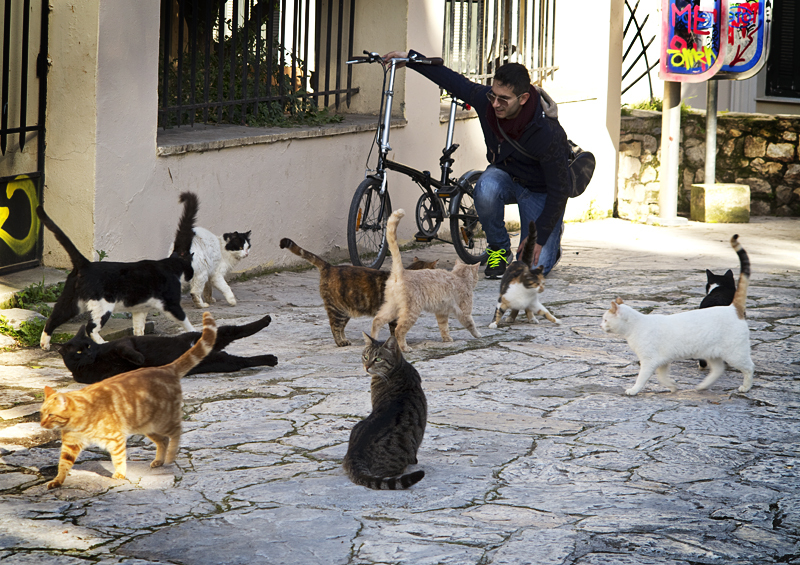 Wow, that’s a lot of cats. Since I have a severe allergy to them, I would be running in the opposite direction. I hope they are cared for well…and kept far away from me. 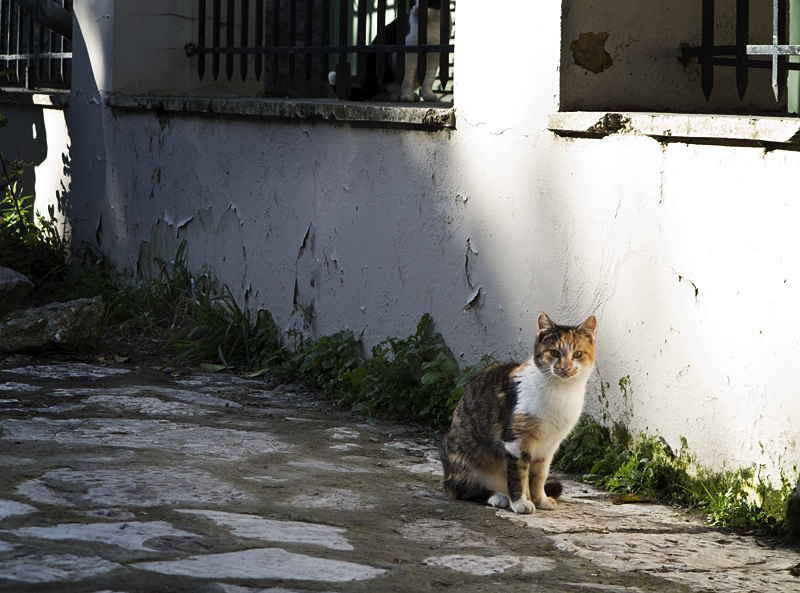 We also have a lot of stray cats and dogs here lurking in the streets. Some barangays put them inside cages, sell them, or donate them away to willing owners. The worst thing we have heard is that the cats were eaten or sold as food. That’s really horrible. Oh man! That’s crazy, indeed! My husband and son have severe cat allergies so you wouldn’t find them anywhere near these cats! But why so many strays?! Oh how lovely, that man with the wooden flute sounds like the pied piper of cats, how quaint and whimsical that is! 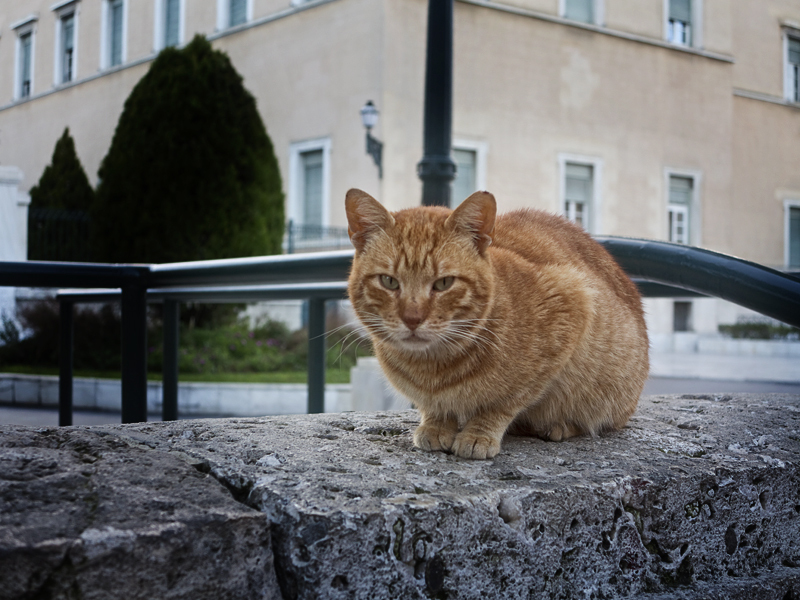 I love cats, as does my little boy, he calls them miaows so if he saw the cats on the streets of Athens he’d be amazed. I’m so glad to hear that they’re so well looked after, it’s always great to hear of people being kind to animals. 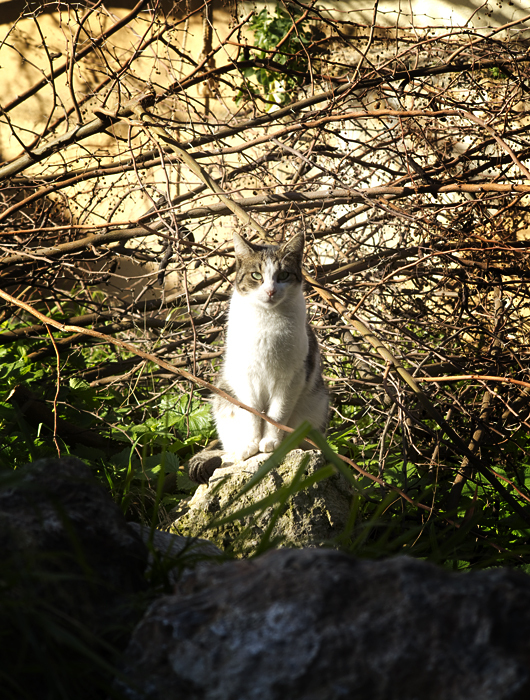 I also noticed all the stray cats in mediterannean cities! It’s funny how differently we view things in different countries! Your pictures are stunning!! That’s a lot of cats! I like how they all look different in their color and markings. However, I’d be a little nervous to approach such a large gathering of cats, dogs or any other type of animal since they would outnumber me.